Product #17179 | SKU PT-P2-R66X3TB | 0.0 (no ratings yet) Thanks for your rating! The Promise Technology 18TB Pegasus2 R6 is a Thunderbolt 2 RAID storage array designed for simultaneous streaming, editing, and backup of high-resolution videos and large multimedia files. This storage array's Thunderbolt 2 interface offers high-speed connectivity. 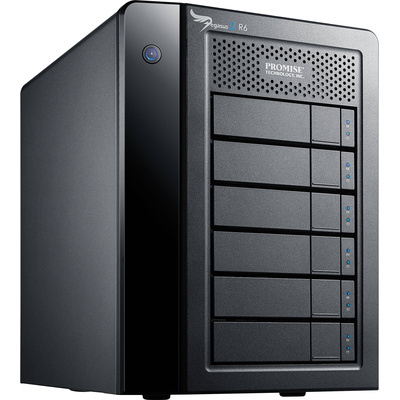 The Pegasus2 R6 stores up to 18TB of data and consists of six 3TB 7200 rpm SATA drives. Actual storage capacity will differ according to the RAID configuration. These drives are hot-swappable for easy access and come pre-configured in RAID 5 mode, which is optimised for data protection, capacity, and performance. RAID levels 0, 1, 5, 6, 10, and 50 are also supported; each level offers configuration options for capacity, data protection, redundancy, and speed. The Pegasus2 R6 storage array has dual Thunderbolt 2 ports, one port for direct system attachment and another port for daisy-chaining up to 6 Thunderbolt 2 devices. This storage is formatted in the HFS+ file system for Mac and is compatible with Time Machine in OS X, which automatically backs up your entire Mac system. The Pegasus2's Thunderbolt 2 interface is sufficient for handling and accelerating 3D or 4K (UHD) workflows. Thunderbolt 2 uses the same cable as the previous generation but has double the available bandwidth for a maximum throughput of 20Gb/s. The bandwidth of Thunderbolt 2 and the Pegasus2 is designed to give professionals the ability to edit and view live 4K streams while backing up the same file to a single or daisy-chained Pegasus2 storage array system.